Beijing Bus Transport - The Beijing of today is a giant modern city of over 16 million inhabitants full of Busses. The City, a huge sprawling landscape in which modern highrises were unusual before, covers an area of 16.800 square kilometers. With City limits extending some 130 kilometers ( 80 miles ) obviously, excellent City Transportation System was and is needed. 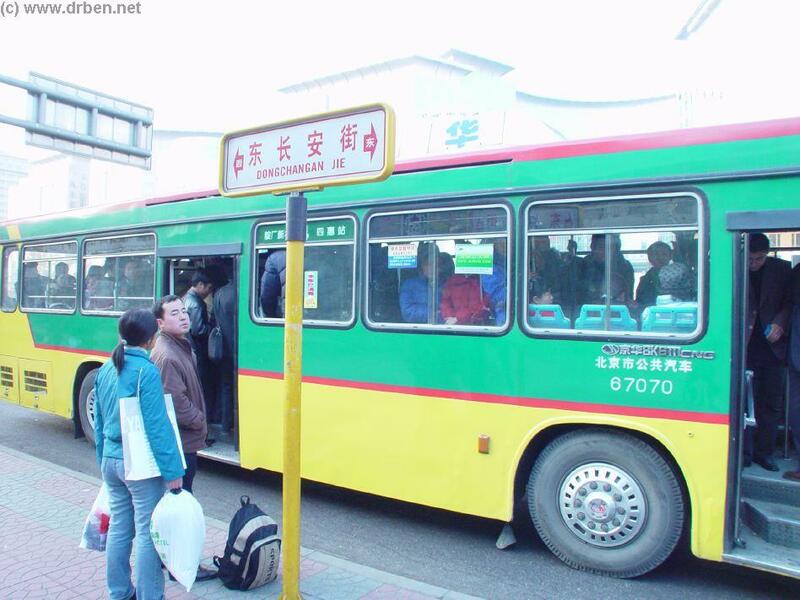 Throughout history it has been the Beijing Busses that were the preferred transport of native Beijingers. Still many use the Bus, a cheap mode of transportation but since the 2008 AD upgrade of the Metro (Subway) the Underground Trains are a good and fast alternative for Travel around the Inner City. For travel to the Outer Suburbs and Rural Districts, Bus Lines are still a necessary mode of transport. Use this Page as your Guide to valuable Beijing Bus Lines to Travel to destinations in the Outer Suburbs and beyond. Tourist Bus to 13 Ming Dynasty Tombs and Badaling Great Wall of China - Take a Peek at the Qianmen Tour Bus Station (across from the Old Qianmen Train Station) for an easy and cheap unguided getaway to the Great Wall of China at its nearest spot outside Beijing and the unforgettable historic 13 Ming Dynasty Era Tombs, which are all on the UNESCO United Nations World Heritage List. A modern Beijing City Bus in the most standard colors loading passengers at ChangÁn Jie ( Oriental Plaza ) , Downtown Beijing's Main Artery. An older style of Beijing City Bus ( Levathian ), now virtually fased out of use passing underneath pedestrian walkway west of Oriental Plaza. Beijing Bus Basics - In the Past, the Basics of Beijing Busses could be kept very short - It is cheap, and it is usually not what you want ! As mentioned it is true that Busses were the preferred transport of native Beijingers. However, that in no way means that the Bus Ride was enjoyable. The busses usually were rather slow, suffered increasingly from traffic jams and were overcrowded. Although there was a Metro/ Subway System , it was a popular alternative only for travel around the Inner-Most City. Hence, Beijing's roads became increasingly clogged with Cars and Busses full of commuters trying to get somewhere. It was becoming impossible and damaging to the booming economy and a Solution for the City Transportation System had to be Found. With dawn of the New Millenium Beijing City started planning a large overhaul and these plans were only enlarged when in 2003 AD Beijing was selected as the Olympic Host for 2008 AD. 4) You may get pickpocketed easily in the crowd (??). 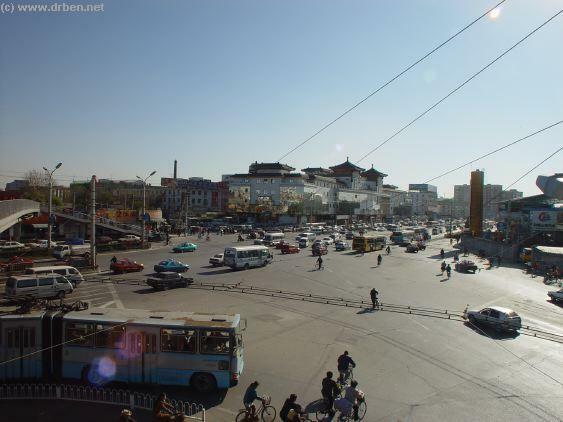 Since the number of cars within Beijing exploded into 400.000 in 1 year and into 5 million in 2005 AD, Beijing Busses are more usually then not trapped in traffic. If you are in for a speedy or timely arrival, this is a huge problem. For any longer distance, you really don't have a chance. Our advise : Don't do it !! Only for specific destinations such as the outlying Marco Polo Bridge ( still outside the Metro network ) or the TianNing Temple use Bus transport. Even then, consider a Taxi for speed and convenience. Bus Operating Hours - Beijing City Busses operate from 5 AM to 11 AM Daily, throughout the city. 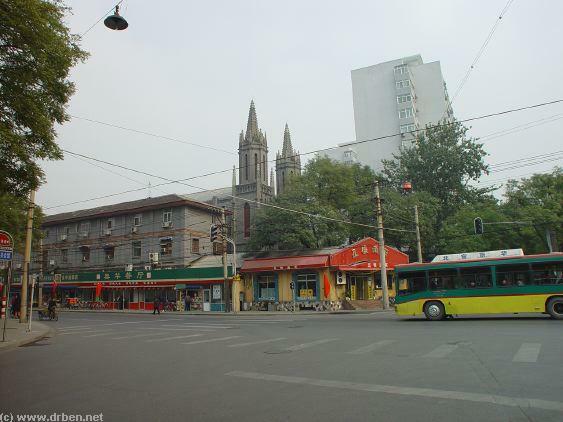 A Modern low-pollution Beijing City Bus at Dongjiaomin Catholic Church. Due to the extraordinarily increase in traffic, the city has been forced to convert to more environmentally friendly cars & busses fast. For 2010, an entirely "new" Beijing is planned with industry far outside the City center. 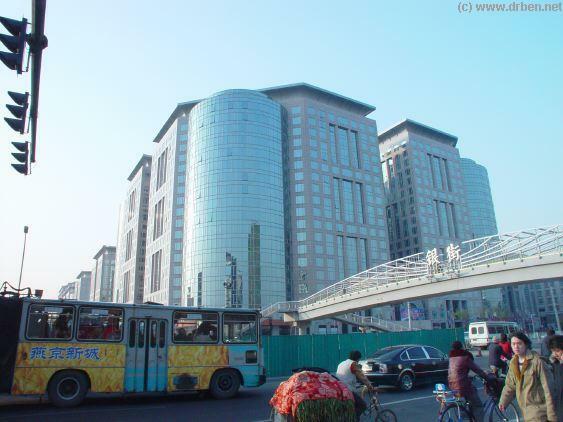 Bus Line Basics - In short there are 3 types of Beijing City Bus. Single and Double-digit numbered Busses are those circulating downtown Beijing (City Center). 300 number-series Busses are those moving about the outlying suburban areas. Make this as a first distinction !! The third important type of Bus are the 200 number-series, which are night-time Busses with different operating hours. Just to be complete - a 4th Type of Beijing Bus are the Trolley Busses, all number in the 100 series. A special kind of Bus are the double-deckers that circulate the city centre, these have special numbers and are described later in this report. Older Beijing Bus at Tiantan Dong-Lu across from Hong Qiao Market. 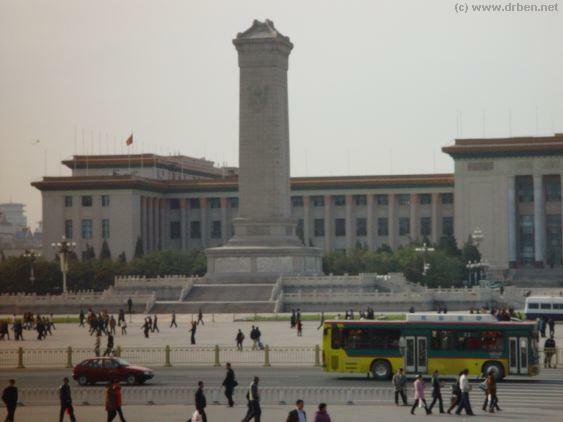 Special Beijing Bus-knowledge and Tips - Your most important pitfall with Beijing Busses is undoubtedly the fact that Bus Fares are payed by the stop. A modern environmentally less polluting Bus passing by The Monument to The Heroes of The Revolution at Tian an Men Square. A special place should be reserved for Circular-Line City Busses. The special type of air-conditioned Beijing Busses can be convenient and usually have a seat for all passengers. Unfortunatly, so far, we have not been able to scout out the use of these long distance lines. More information follows when available. More photos and information follow when available. Check the Site-Announcements ! 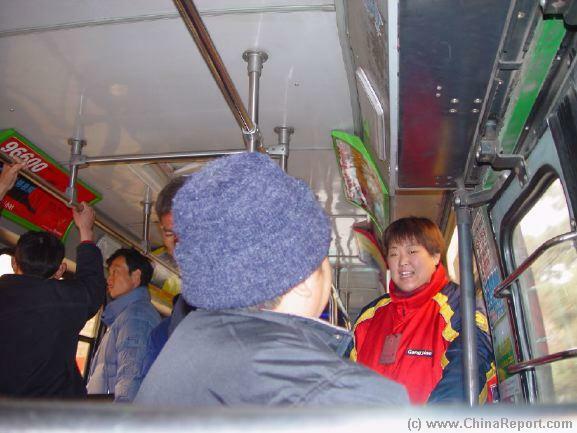 Inside a Beijing Bus , the lady with the Bright Colored outfit is the Ticket Person. An example of the current and latest model bus now in use in the City. 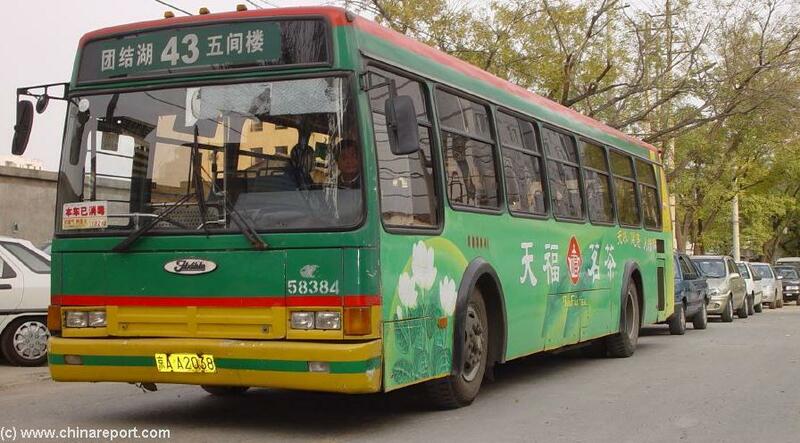 A Beijing City Bus stuck in traffic at one of the lush green lanes of the Northern Chongwen District near ChongwenMen. ask the bus driver or ticket sales person while on the Bus. convenient than as is currently the case. A further interesting change will be the introduction of off-bus ticket sales, a fenomenon earlier unseen in China. During the Years 2007 / 2008 AD a brandnew and extended Subway/Metro System was introduced drastically improving the number of destinations reachable by Underground Train. Much of the functions of the Beijing Bus System have now been taken over by the Subway/Metro System, however Beijing Busses - new, improved and more environmentally friendly remain an indispensable part of the Backbone of the Beijing Transit System. The Pro's of Busses : 1) It is really cheap. Bus-fares in Beijing go as low as 0.30 Yuan for short inner city distances. This is bottom price. For longer distances count on about 1 Yuan. 2) A Beijing Bus gets you to almost any direction. If you can find the proper line ( and perhaps a good city map ) expect to be able to hit almost any City Destination. 3) Beijing Busses are a jewel of City Life. Beijing busses are really crowded and get you "in touch" with Chinese ? ?